Lady Banks rose (Rosa banksiae 'Lutea') is one of the first roses that blooms in my garden. Its dainty, soft yellow flowers come in clusters on long arching canes. This time of the year it provides a surprise spray of color in the 'Down Under' (part of the yard). It blooms profusely but only once a year. Fig. 2 The fence provides a support for its arching slender canes. Some of the cane lean against the fence on the eastern side of the yard. This rose could be trained onto an arbor or strong trellis. Fig. 3 Canes drape on the nearby plum tree. This year I allowed some canes to extend beyond to the height of the plum tree growing next to it. The delicate flowers cascading on the tree is a very pleasing sight (Fig. 3). However, knowing how aggressive this rose is, I prune it down every year. Discipline is required for this rose in order for the plum tree to thrive. There is mulberry tree nearby which shades it during part of the day and thus regulates its growth a little bit. Fig. 4 Clusters of tiny soft yellow flowers. Rosa 'Lady Banks' has small glossy leaves. In our area, the plant is evergreen and almost pest-free. The canes are vigorous growing more ten feet per growing season. The rose is almost thornless which makes it rank high on my list of preferred plants for my garden. Rosa banksiae near a creek; my daughter following some ducks. Named to honor the wife of an English botanist (Sir Joseph Banks 1743-1820), the Lady Banks rose is nobility in season. Fig. 1 Volunteer potato plant. Ever since I planted my first potato crop in my garden, volunteer potato plants became a normal occurrence every spring. No matter how much I'd try to look for all the tubers at harvest time, there would always be some tubers left behind. As a general rule, I rarely use the same area in my garden for the same crop two seasons in a row. In other words, I practice crop rotation. The result of this is that some of the weeds that I have to remove from my garden before planting my spring crops are volunteer-potatoes (Fig. 1). Sometimes when I pull them out of the ground they already have new potatoes (small and immature tubers) which when boiled and buttered make a treat for my kids. When I was pulling the volunteer potatoes, I saw one that I could use as a visual aid for something I'd like to talk about - the parts of a potato plant that directly affects its performance. Fig. 2 Parts of a growing potato plant. Mother tuber is the seed tuber that was planted and where the new crop has grown from. My former professor, Peter Vander Zaag, used to say that when a healthy seed tuber is planted, it is likely that it will remain till harvest time as a mother tuber. 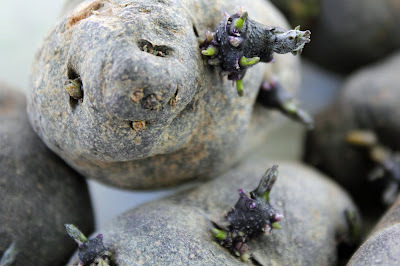 Why it is called a mother tuber-- I'm guessing that it is because it has had the chance to reproduce. :) A firm and healthy mother tuber at harvest time indicates that the early growing conditions of the crop was favorable allowing the new plant to shift from being dependent (drawing energy from the mother plant), to independently producing energy (through photosynthesis) before the energy from the mother tuber is depleted. The mother tuber in the picture (Fig. 2), being a volunteer potato, was situated close to the surface of the soil. It was exposed to a larger array of pests as indicated by the presence of holes on the tuber. Fig. 3. Stolons develop underground; lateral stems develop above ground. Fig. 4. Sprouts on the seed tuber corresonds to the stems of the potato plant. The stems are generally green but the buried section is white (Fig. 2 and Fig. 3). Depending on species the stems could also be purple or reddish brown. Fig. 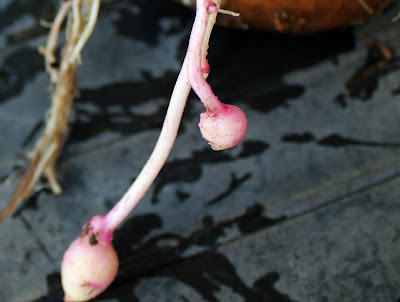 5 Tuber initiation - apical ends of stolons developing into tubers. Nodes are the points on the stem where buds, lateral branches, and leaves originate. In the case of the underground part of the potato, it is the point where the roots and stolons arise. The space between nodes on the stem is called internode. Planting deep enough to allow more nodes below the soil surface helps increase root and stolon formation. Roots. 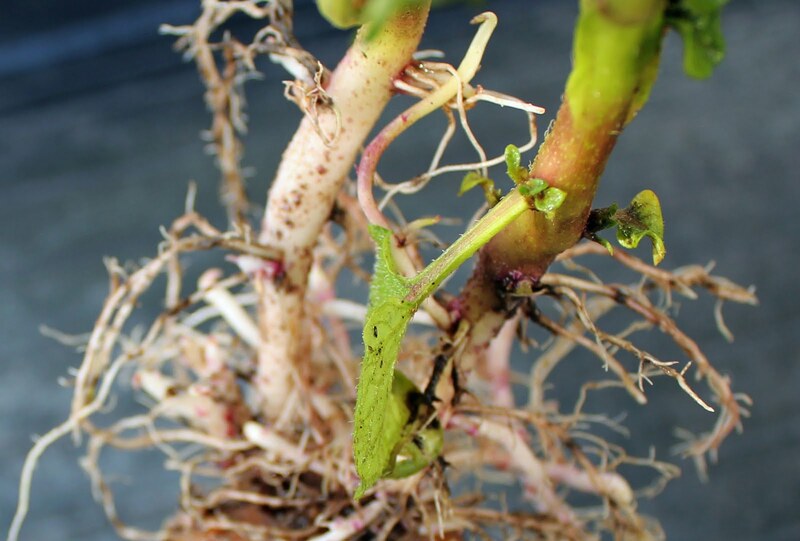 Potatoes that are grown asexually (from tubers) develop adventitious roots. The potato plant has a root system that seem unsubstantial (Fig. 2) and growing superficially during its early growth stage . Maintenance and conservation of soil moisture is important for this crop. For small gardens, mulching is a practical management practice to take into consideration. Understanding the growth habits of plants help gardeners choose appropriate management practices for their crops. Fingerling Potatoes are small, narrow, and elongated potato tubers in their mature stage. Some varieties resemble the shape of fingers (Fig. 1), hence the term fingerling. Other varieties have distorted shapes because of deep eyes (Fig. 3) but they still count as fingerling because they meet the size. Fingerling potatoes range from one to two inches in diameter and with lengths ranging from two to three inches. Posh price for posh potatoes. Fingerling potatoes have now become popular in upscale grocery stores. They are turning up on the featured entrées on menus of fine restaurants in big cities. The novelty of their petite size, unusual colors (including deep purple) and texture provide extra drama on the otherwise traditional potato. Its posh position in the modern culinary world is reflected on its price tag. Try going to the stores and compare the price against the other potato varieties and you will come up with a price that is three to five times more expensive. Fig. 3 Etiolated sprouts grown in the dark. From my pantry to my garden. From time to time we would buy a bag of fingerling potatoes from Costco - but this time the tubers started to sprout before we could eat them all. They were stored in a dark corner of my pantry hence the etiolated white sprouts (Fig. 2 and Fig. 3). Etiolated sprouts are not fit for planting because of their lack of vigor. So I placed them in a tray by the window sill to expose the tubers to diffused-light. After ten days the sprouts looked more sturdy and vigorous producing the necessary pigmentation (Fig. 4). Now, that is the appearance of a seed tuber that promises a good crop (Fig. 4). Fig. 4 Green and vigorous sprouts - qualities of a good seed tuber. 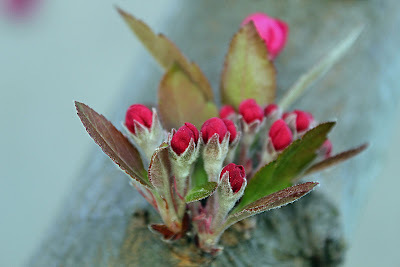 My flowering crabapple tree (Malus floribunda) is in bloom again. Every year this tree reserves a two-week period when it becomes the center of interest in my yard. During this time the tree is an explosion of pink inflorescence that attracts so many pollinators. From a close distance one could hear the buzzing of bees all over the pink canopy of the tree. 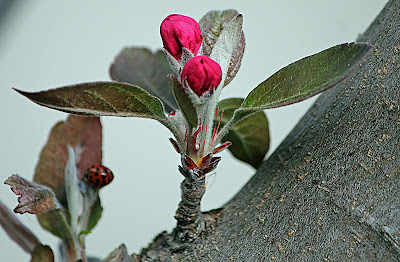 Profuse flowers come in succession which makes this tree and important pollenizer for the 'Fuji' apple which blooms about ten days later. 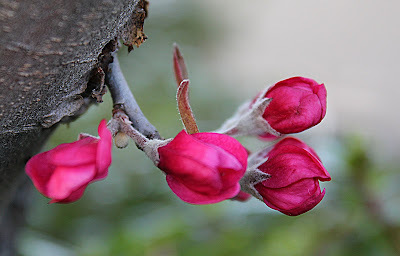 Dark pink flowers come out from the main trunk of the tree. Leaves starting to increase their coverage. Flowers at different stages on the same branch. 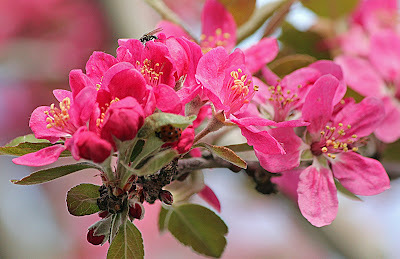 The flowering crabapple tree is both beautiful and useful as pollenizer and shade tree.